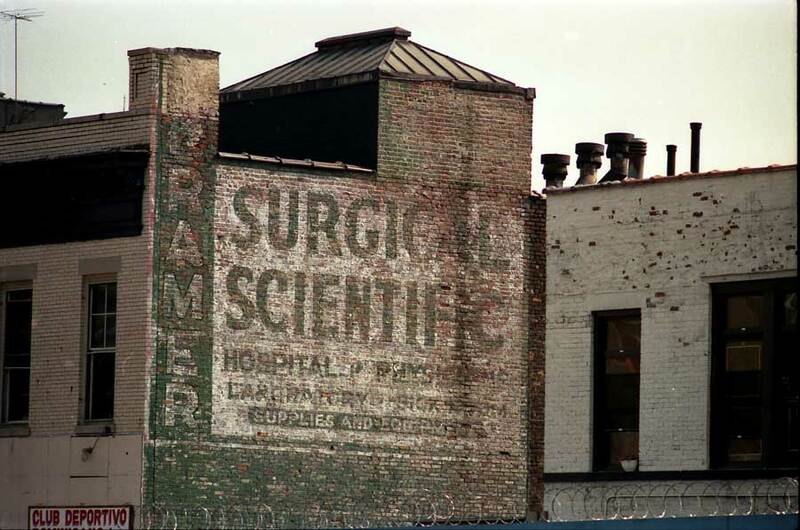 The Kramer Surgical Stores / Kramer Scientific Corp. were in business in New York approximately 1905 to 1993. They were located here on St. Nicholas Avenue near 168th St. from 1934 to 1958, but were preceded by a long history, beginning with the Mount Sinai Surgical Supply Co., founded by Herman S. Kramer (1861-1938), at 1459 Madison Ave. ca. 1905. The business name changed to Kramer Surgical Stores in 1921. Three of Herman S. Kramer's sons were also involved in the business. These were Bertram Solomon Kramer (1889-1964), Murray Kramer (1893-1969) and Raymond Kramer (ca.1902-?). The Kramer family were recorded in the 1910 U. S. Census living at 1459 Madison Ave. Herman S. Kramer was 47 years old, born Russia, immigrated 1874, naturalized citizen. His occupation was "Bandage Maker, Own Shop." Among his four children were Bertram S. Kramer, age 20, a language teacher, giving private lessons; Murray Kramer (called Maurice), age 16, a clerk in a law office; and Raymond Kramer (called Romeo), age 8. Of the three sons, Murray Kramer was primary, and was probably sole owner at 1166 St. Nicholas Ave. after Herman Kramer died. Bertram S. Kramer became a physician, and Raymond Kramer had his own surgical supplies business on the Grand Concourse in the Bronx during the 1930s. For a few years in the 1910s Murray Kramer was listed as the owner of the New York Surgical Supply Co. at 1459 Madison Ave. This short obituary notice for Bertram S. Kramer appeared in the New York Times, 10 March 1964, "Miami Beach, March 9 - Dr. Bertram S. Kramer, a retired New York ophthalmologist, died here on Saturday at the age of 74. Dr. Kramer had an office at 1882 Grand Concourse, the Bronx, and his home at 2420 Sedgwick Avenue in that borough. He retired in 1954 as a consultant at Jewish Memorial Hospital and associate attending ophthalmologist at Montefiore Hospital, both in New York. He leaves his wife, Mrs. Martha Ullman Kramer; two sons, Stanley and Melville; two brothers, Raymond and Murray, and four grandchildren." This ad for Raymond Kramer appeared in the New York telephone directory in 1930. Raymond Kramer is referred to as "Formerly Bronx Branch Kramer Surgical Stores, Inc."
This ad for Kramer Surgical Stores appeared in a yearbook published by the Columbia University College of Physicians and Surgeons, 1962. Their address at this time was 554 W. 168th St., where they were located from 1959 to 1969.